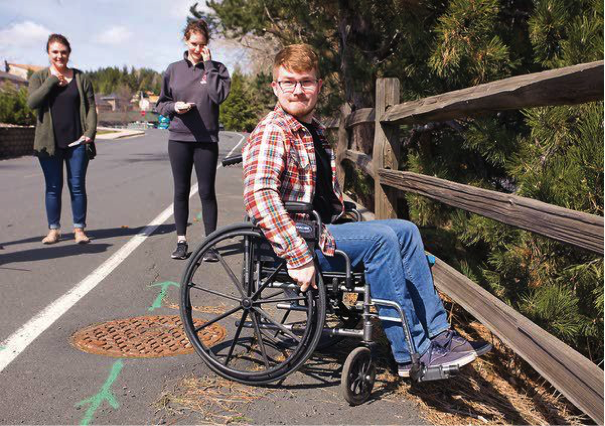 Washington State University student Zack Malmberg tries to negotiate uneven pavement using a wheelchair while classmates Natalie Swanson, left, and Hayley Sandberg watch Friday in Pullman. The students were helping to map Pullman businesses for accessibility to people with disabilities. If you had to navigate the streets, sidewalks and businesses of Pullman with a physical disability, what would you find? Do Pullman businesses conform to the Americans with Disabilities Act of 1990? More than 30 students from a Washington State University health communications course began to answer that question for themselves Friday afternoon as they partnered with BluePath, an organization dedicated to mapping ADA accessible businesses across the Pacific Northwest, to map what they could of Southeast Bishop Boulevard. The students split into groups, with one taking a wheelchair along to experience firsthand what it is like to navigate a business on four wheels. All students were armed with bright blue yardsticks to measure doorways, paths and thresholds; BluePath brochures; and quick appraisal checklists to determine how well each business complied with the ADA. Zack Malmberg, 22, of Pullman, rolled himself up the hill to Village Centre Cinemas, getting stuck on a manhole five minutes in and nearly rolling into a nearby creek had it not been for a wooden fence keeping him safe. Malmberg said he was not sure how good the wheelchair was in the first place, but he found it difficult to control, especially over bumps and on roads with a side slope. The seemingly small obstacle was eye-opening for some of his peers, who determined the bump in the road was a huge problem after all. “Honestly, imagine how hard that would be if you actually didn’t have a lot of mobility in your arms and hands too. That would be pretty much impossible, I feel like. You’d have to go in the road,” Natalie Swanson, 21, of Pullman said. Malmberg also noticed it was impossible to use his cellphone at the same time. The group had no luck at the theater, which appeared to be closed, though they noticed it had a large parking lot and lacked an automatically-opening door. With that, they headed to other businesses. Swanson tried the chair herself, calling it quits after the group passed the manhole cover again. One of the group’s biggest obstacles was the boulevard, filled with passing cars. One student noted most people on foot would jaywalk rather than find a designated crosswalk. In a wheelchair, you could barely jay-roll, she said. Chain businesses like the Holiday Inn Express were more thoroughly prepared as their headquarters require branches to meet ADA guidelines – something the students learned as they visited the hotel. They found the interior of the building had low desks and counters, wide paths, an accessible swimming pool, along with accessible bedrooms, outlets and peepholes. A Verizon store also impressed the students with its accessible phone displays and counters. The store bore a wheelchair logo on its front door. At Crimson & Gray, Hayley Sandberg, 21, of Pullman, took to the wheelchair to experience shopping. Though the business had a large elevator and wide enough pathways, Sandberg had trouble reaching textbooks on high shelves. The pathways between books, though wide enough for her chair, gave no room to turnaround, leaving her forced to roll backward down the aisle and take a different turn. And it was not until the students visited Irwin, Myklebust, Savage & Brown P.S. Attorneys at Law that they found an automatically opening door, prompting “wows” from the group. “I never thought of how useful that is,” Malmberg said. The students were one of several groups at WSU to participate in a “mapathon” this month. Next month, BluePath will head to Vancouver to conduct more mapathons and further develop its website before increasing its marketing to a wider audience. Areas of Idaho and Oregon have also been mapped. The website will become something similar to Yelp or TripAdvisor – a place where those with disabilities can find businesses that are easily accessible, said Vicki Leeper, marketing specialist for DACNW. “You have to have enough businesses on it that people with disabilities find it useful,” she said. Mark Leeper, executive director of the Disability Action Center Northwest, said the experience is important for students to appreciate the ADA, especially when the law has always existed for most of them. The act was signed into law by President George H.W. Bush nearly 27 years ago. As for businesses, Leeper said they should not be afraid to acknowledge when they are behind on certain ADA requirements. “If they’re making a good faith effort … it’s a civil rights law and so it’s not black and white criminal code or something,” Leeper said. Visit www.blue-path.org for more information. Taylor Nadauld can be reached at (208) 883-4630, by email to tnadauld@dnews.com and on Twitter @tnadauldarg.